Hi everyone! Today is a fun day. Today is a StencilGirl Blog Hop and this hop is featuring stencils that I have designed. I invite you to grab a cup of coffee, or whatever you fancy, and settle in front of your computer and hop along with me and several other artists who are sharing what they have done with the stencils. The theme of the hop is Grateful. One big huge thing that I am grateful for is my family. I love being with them, supporting each other, being there for each other and sharing. 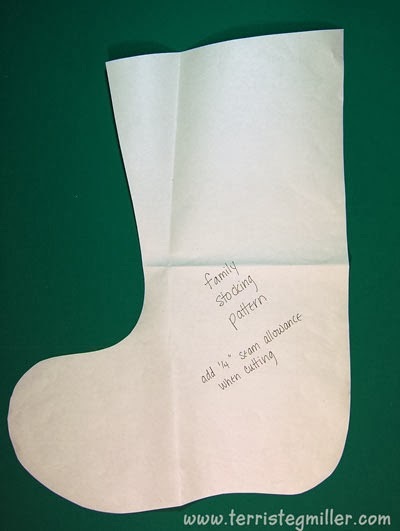 This year I was determined to create a set of family Christmas stockings. In years past we each had a stocking but they were all different sizes, colors, etc. I wanted to create something that coordinated and looked really good hanging together. 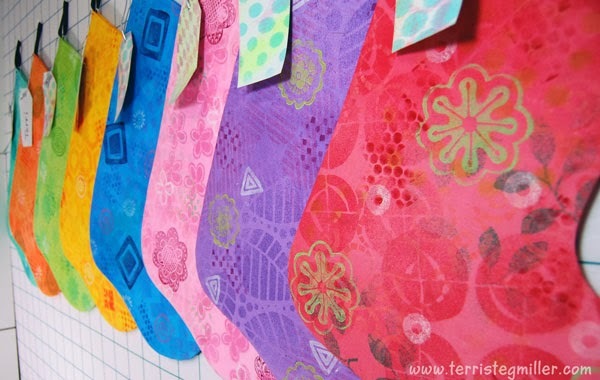 I started by creating the fabric for the stockings. 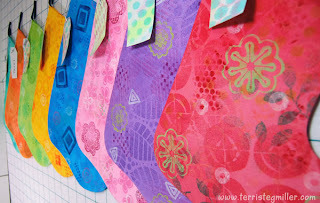 I used cotton duck for my stockings but you can use any fabric you like. The step-out examples below are shown on 100% cotton PFD quilting quality fabric. 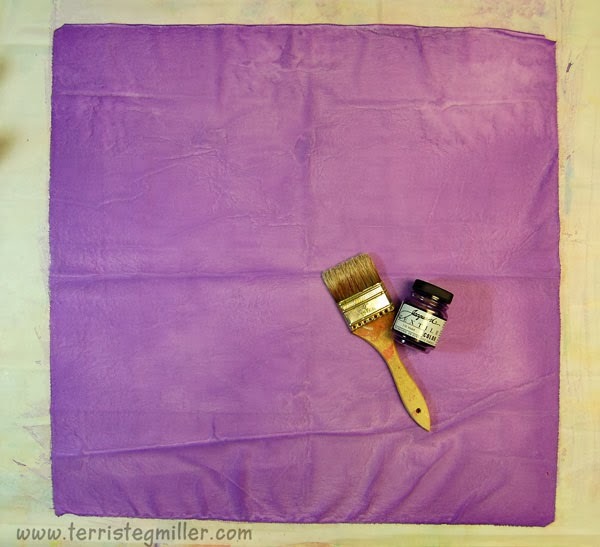 An alternative to painting on a white piece of fabric would be to skip the first step and use a commercial fabric in a color you like. For the first layer of color: I spray the fabric with water before painting on the color. 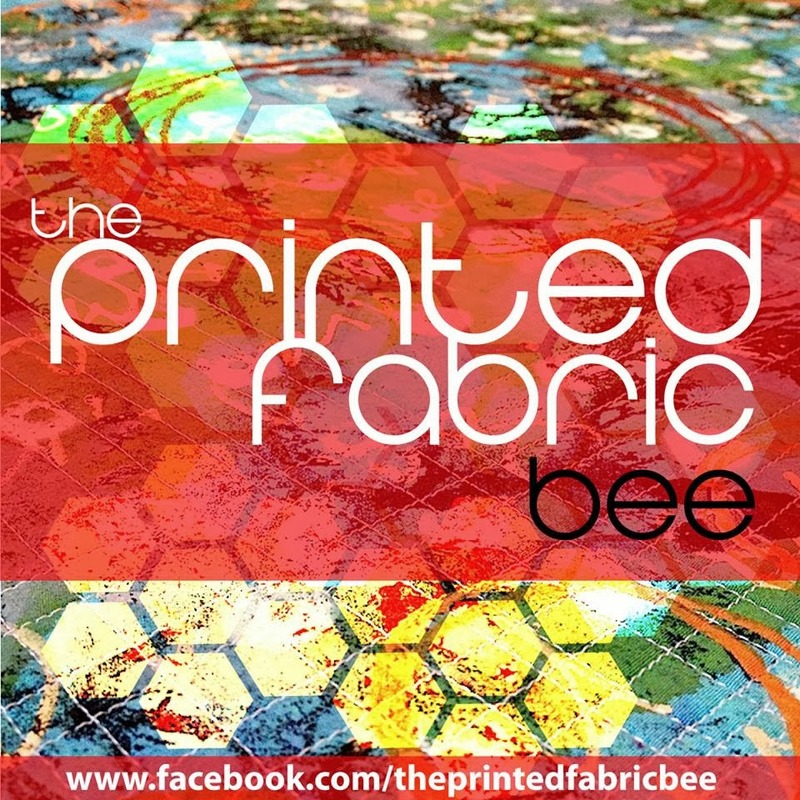 It helps the color penetrate easier into the fibers. I diluted some Jacquard Dye-Na-Flow so that the color was more in a light to medium tone. I don't start with a dark color base because that makes successive layers of design harder to see. I painted color over the entire surface and let it dry completely (overnight). 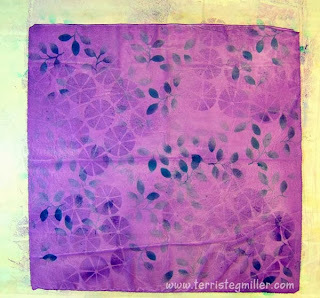 I have also used watered-down textile paint for this step. 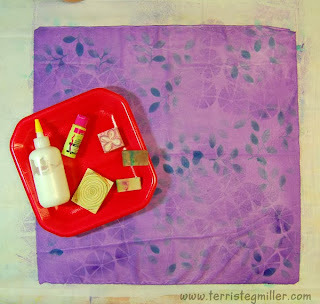 Next I chose a couple of stencils and two colors of Tumble Dye spray-on fabric paint. 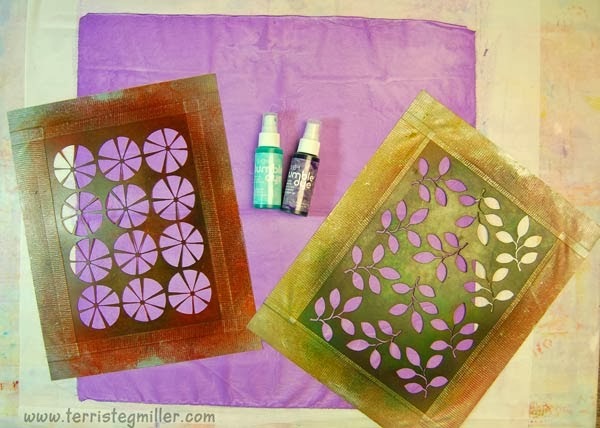 The stencils I am using are Leaves and Slices. 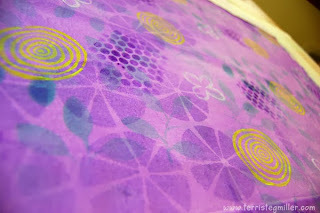 I placed the stencils randomly and sprayed the color to create the designs. 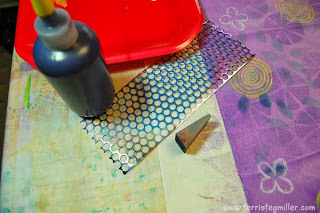 For the next layer I used a couple of my hand carved stamps, textile paint, and sponge wedges. I randomly applied these designs across the surface. And for the final step, I used a darker shade of textile paint, a sponge wedge, and a piece of sequin waste to create even more interest to the surface. Allow the fabric to dry completely. Heat set with your iron. Flip the fabric upside down and iron from the backside for a few minutes. I drew a stocking pattern in the shape and size I wanted on some paper. Before I cut the fabric out using the stocking pattern, I fused a lining fabric to the backside with Mistyfuse fusible web. You can see how the lining looks in one of the stockings in the next photo. Cut out the pattern, you will need two pieces that are mirror images of each other. 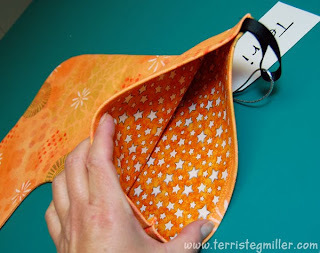 Fold down the top (opening edge) and stitch a 3/4" hem on both pieces. Place the two stocking pieces with right sides together and stitch with a 1/4" seam. Clip curves and turn right side out. 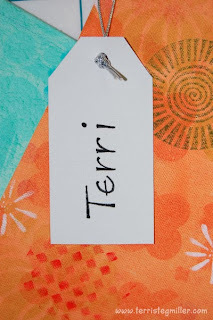 Attach a hanging loop and name tag. For the name tags, I used a piece of Roc-Lon Multi-Purpose cloth. This fabric does not fray, so you can leave the edges unfinished. 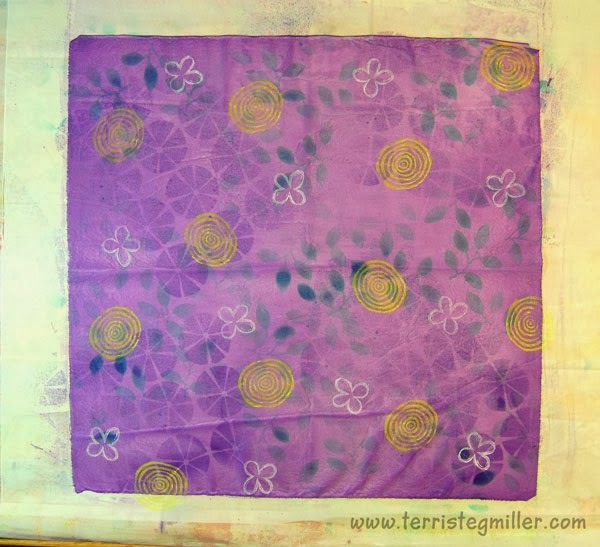 I applied stencil designs to one side of a piece of Multi-Purpose cloth with Tumble Dyes and let that dry. 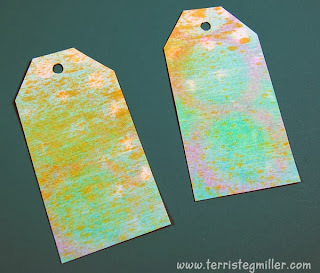 I created a tag template and cut out the cloth tags. I used a paper hole punch for the holes but did need to help clear the holes with a small pair of scissors. 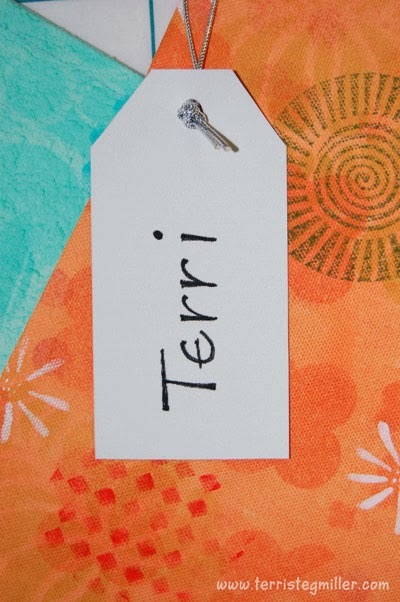 On the white side of the tags I wrote the names of my family members with a fabric gel pen. I then attached the tags to the hanging loop on each stocking. CONTEST IS CLOSED - THANK YOU! A set of Tumble Dye fabric paints and two 6x6" stencils (Daisies and Layered Salad). 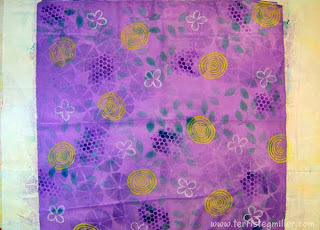 I am also including the fat quarter of purple fabric I demonstrated with in this post. I will announce the winner here on my blog on Monday, November 25. But wait! There's more chances for you to win a prize. Visit all of the blogs in the hop (listed below) and leave a comment. 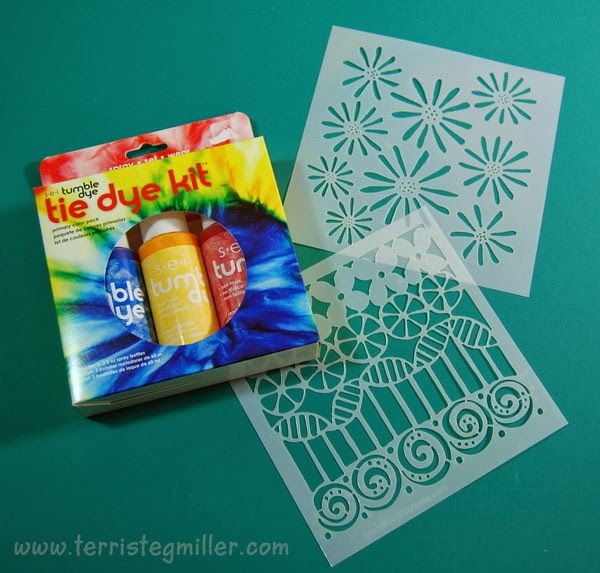 You will be eligible to win some stencils. Visit the StencilGirl Talk blog to see the stencils you have the chance to win.